Communities for Restorative Justice (C4RJ) - a former MACUCC Barnes Grant recipient - in collaboration with the Suffolk University Center for Restorative Justice, will bring national restorative practices and bullying prevention expert Nancy Riestenberg to the area for two forums this November. These events are endorsed by the Restorative Justice Task Team and the Justice & Witness Commission of the MACUCC. 1. A free community forum will be held Friday November 9, from 7-9 p.m. at RJ Grey Middle School Auditorium in Acton MA. Nancy will offer a keynote on the topic of restorative practices and their application in instances of bullying and in cultivating a respectful learning environment; a panel will respond. Again, this event is free and open to the public, but registration is required to aid our planning. Click here for more, or to register. 2. 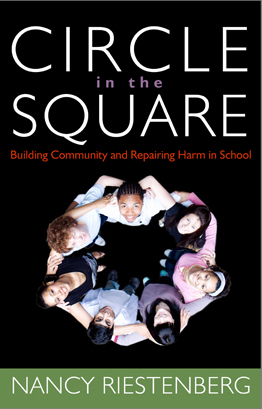 A day-long training on restorative practices in a school context will take place Saturday Nov. 10, 2012 with Nancy. This training on restorative practices is designed for school affiliated individuals (teachers, counselors, administrators, etc.). Participants will have hands-on learning and will come away with tools to use in the school and classroom context. CEUs will be available (details forthcoming). Cost is $75. Click here for more details and to register. Space is very limited, so register early! Click here for more, or to register. Howard Zehr mentioned at the June "Day of Restorative Justice" event that restorative justice principles were seeing the most growth in school settings. He also wrote a strong endorsement for Nancy's book: "Restorative practices are 'what's happening' in schools today.... Every teacher, every administrator -- indeed many parents -- ought to have this book."